Mexico's Calderón Needs to Listen, Not Just Lecture U.S.
Nine years have passed since a Mexican President last addressed the U.S. Congress. That was Vicente Fox, just days before 9/11, after which al-Qaeda's horrors all but erased Mexico from Washington's foreign policy radar. But, surprise, our southern neighbor's problems refused to go away. While we were fighting off an Iraqi insurgency, Mexico's drug war morphed into a ghastly narcoinsurgency that threatens to spill over the Rio Grande. While we were dropping the ball on immigration reform, Mexico kept pouring undocumented workers into the U.S. So perhaps we deserve some of the lecturing we're bound to get from President Felipe Calderón when he climbs Capitol Hill on Wednesday. He'll point out, as the Obama Administration has conceded, that much of the blame for Mexico's horrible narcoviolence lies with our insatiable demand for drugs and our lame-brained refusal in 2004 to renew a ban on assault weapons that are being smuggled into Mexico. He'll insist, rightly, that we comply with NAFTA and give Mexican trucks access to U.S. highways. And he'll rail at Arizona's hysterical new anti-immigration law, which allows police to detain anyone they suspect of being an illegal immigrant  and which critics call carte blanche for racial profiling of Mexicans and other Hispanics. "It opens the door to intolerance, hate and discrimination," Calderón said recently. "My government cannot and will not remain indifferent." Once Calderón has had his say, however, let's hope that President Obama and congressional leaders give him a little piece of their minds before they toast him at Wednesday's White House state dinner. After all, blaming the U.S. for Mexico's flaws is a time-honored Mexican presidential tradition, even for Calderón. He suggested to Reuters last week that criticism of his handling of Mexico's crises was simply a result of flawed public "perception." But on the two biggest issues facing U.S.-Mexico relations, drugs and immigration, Calderón's failings are as much reality as America's are. Calderón must know that many in Washington have begun to question his reliance on Mexico's military to fight the powerful drug cartels  and that enthusiasm for the U.S.'s $1.5 billion in anti-narcotics aid to Mexico under the Merida Initiative has faded somewhat. He's thrown some 40,000 troops at the narcos, and admittedly had some successes. But from terrorized northern border cities like Juarez, where two U.S. citizens with ties to the American consulate were brutally murdered by gunmen on March 13, to southern tourist resorts like Acapulco, the carnage (often including beheadings) has only worsened. 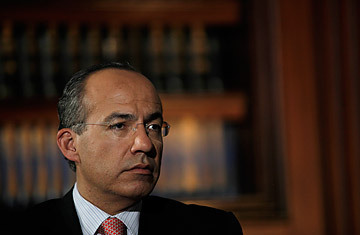 Calderón's government has significantly raised its estimate of gangland killings in Mexico since December 2006, when he took office, to almost 23,000. What's still missing is a sense that Calderón takes seriously enough the only real long-term solution to Mexico's drug war: police reform. "Calderón has taken some positive steps to improve federal police," says Alberto Diaz-Cayeros, director of the U.S.-Mexico Studies Center at the University of California at San Diego. "But Mexico still doesn't have real investigative police forces." And in Mexico, where most cops moonlight for the cartels, the narcos seem more spooked by the prospect of more professional police than by the presence of more soldiers. Last month I interviewed the police director of Calderón's home state of Michoacan, who had just announced stricter recruitment criteria for cops. A week later her SUV was attacked by narco-hitmen with assault rifles and grenades. Miraculously, she survived, but her two bodyguards  who had watched the door during our interview  were killed. Calderón also needs to prioritize another, longer-lasting weapon: anti-poverty programs that give younger and poorer Mexicans economic opportunities beyond joining drug gangs. Mexicans in hard-hit areas like Juarez are giving Calderón an earful in that regard these days, and so should the U.S.  not just because it might blunt narco-recruiting, but because more social-development efforts south of the border also mean fewer indocumentados crossing north of it. Immigration is as much foreign policy as it is domestic policy, and the U.S. has got to push both itself and Mexico's political class to do more to stanch the flow of illegals at the source, inside Mexico, instead of only at the border. Most Mexicans would back us. When Arizona Senator John McCain says, "Complete the danged fence," they know he's shamelessly pandering to gringo xenophobes. But many say there's a part of themselves that secretly agrees with him. A few years ago I talked with some fairly nationalist friends in Mexico City about the $7 billion border wall that Americans were debating. To my surprise, they only half-kiddingly said, "Tell the Americans to build it." Their reason: cutting off the social safety valve of illegal immigration is perhaps the only way to force Mexico's elite to get serious about improving opportunities for Mexicans  almost half of whom still live in poverty, even though Mexican exports to the U.S. have risen fivefold, to more than $200 billion, since NAFTA took effect in 1994. Calderón, who hails from the conservative National Action Party, has taken some positive steps, like a tax-reform measure that may finally get Mexico's wealthiest families and companies to pay their fair share for once. But he "has never articulated a real vision for social development," says Diaz-Cayeros, a former social-policy adviser to the Mexican government. "Then again, the Obama Administration hasn't really articulated its own vision for Mexican development." Given how feckless U.S. immigration reform efforts usually turn out to be, it seems all the more urgent that both sides do more to promote ways to keep Mexican workers in Mexico, like expanding microcredit programs. Those have proven a boon for small entrepreneurs in impoverished rural states like Oaxaca that are a major source of illegal migrants  and they'd be even more effective, Obama should remind Calderón, if Mexico didn't allow microlenders to charge interest rates that top an outrageous 70%, twice the world microfinance average. Just as important, if Calderón wants Obama to work against immigration laws like Arizona's, then Obama should prod Calderón to work for passage of bills like the one sitting in the Mexican Senate right now that would give antitrust laws more enforcement teeth. Most Mexican workers are employed by small- and medium-size businesses, but those enterprises are all too often suffocated by the nation's club of large quasi-monopolies, which include telecom giant Telmex, owned by the world's richest man, Mexican billionaire Carlos Slim. That lack of meaningful competition, as well as an overreliance on the U.S market, is one reason the recession has hit Mexico's economy (which shrank about 7% last year) perhaps harder than any other in Latin America. And that doesn't bode well for the wars against drug traffickers and migrant smugglers. The most salient point Calderón will make to Congress is that the U.S. and Mexico are in this together. That means Washington needs to drop its insensitive disregard for problems south of the border  and Mexico City needs to drop its hypersensitive obsession with tossing blame for those headaches north of the border. If they do, they'll have something genuinely worthy to toast at the White House.